Low density polyethylene spot prices were flat during August on stable market fundamentals owing to the holiday period, sources said this week, as per Platts. LDPE spot prices closed Wednesday at Eur1240/mt (US$1382/mt), unchanged since July 12. Total declared force majeure on deliveries from all its polymer sites in France as the national strike and associated blockades of industrial areas of Gonfreville, Carling and Lavera prevented it fulfilling contractual obligations in H2 May. Despite the stability in August, a number of market participants were bullish going into September, as the holiday season comes to an end. One trader said he saw an increase in requests on Wednesday as was expected following the settlement of the ethylene contract price. The September ethylene contract price settled at Eur925/mt, rolling over from August. 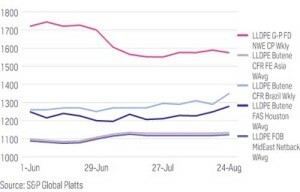 Despite the rollover, one converter said he had received offers for September ranging from stable prices to increases on August’s figures.Flat demand was matched by an easing of supply, with Total lifting force majeure on polyethylene, polypropylene, and polystyrene supplies from its French plants, at the end of August.